But after much thought and prayer, we implemented family devotions after breakfast over two years ago, and you know what? We’re still doing them! 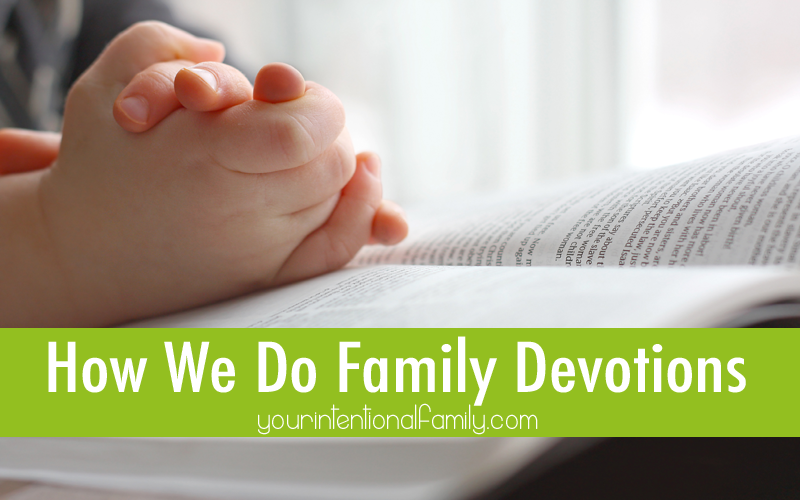 Last year I shared How We Do Family Devotions with a Toddler (complete with videos – so don’t miss it!). At the time of posting, my oldest was just over two years old and we’d been faithfully doing family devotions for more than six months. 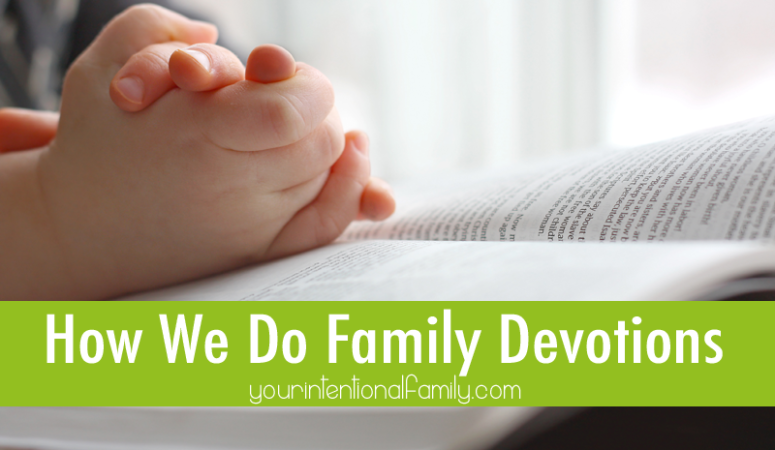 Today I want to give an update on how we do family devotions now that we’ve been doing them for a couple of years (I seriously can’t believe it’s been more than two years already!). We start right after breakfast, or while our oldest is still finishing (he’s a slow eater! ), and we follow the same routine every single day. We sing a song together as a family. We still allow our toddler to choose the song. It’s still not the prettiest sound you ever heard, but it’s beautiful to us and it always makes me smile. Next we read the Bible together – just a short passage. We use The Child Training Bible, and we usually read something from Proverbs or related to the Gospel. We keep it short, and we still don’t talk about the passage unless our oldest seems particularly interested. The point of this time is to create a habit of opening the Word of God together as a family. This is probably my favorite part of family devotions. We use the catechism from reformed.org. 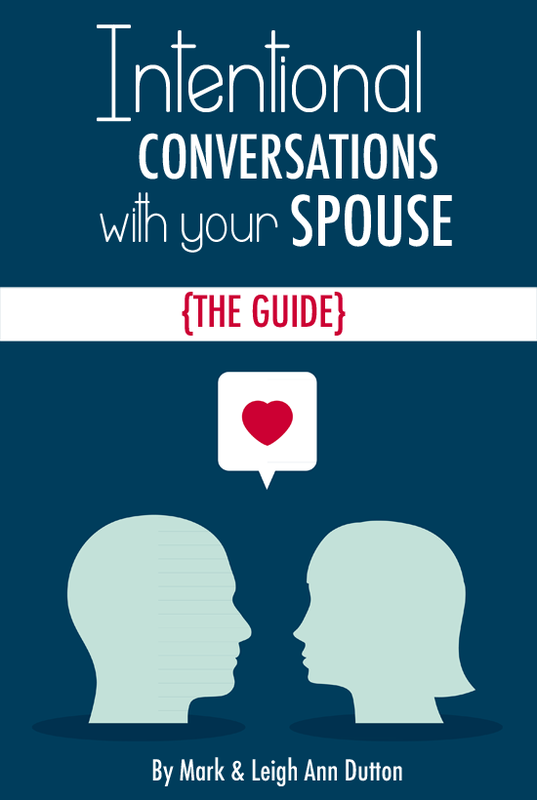 My husband walks my son through the questions, and he answers them with guidance from me, if needed. He’s currently just over three years old and he has memorized through number 13. Here’s a short clip of our three year old working through some of the Catechism just this week! Next we review our memory verses together. This is an area we are slow going in. This isn’t because our oldest isn’t capable, it’s because we aren’t that great about faithfully reviewing and challenging him with memory verses. 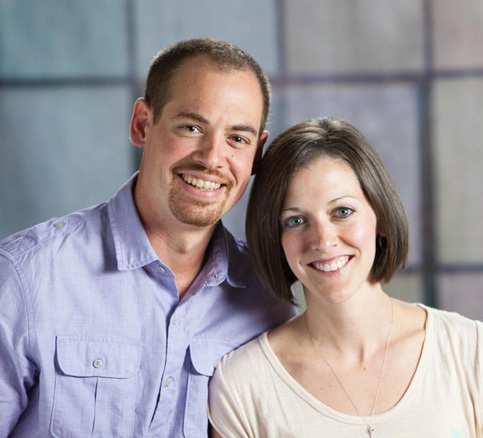 Scripture memory is a weak link for my husband and me. I believe as we grow in scripture memory ourselves, it will translate over to our children. We end our time in prayer together as a family. As of right now we are working on memorizing The Lord’s Prayer together. Our three year old can now recite it along with us almost word-for-word. We’ve been ending our time with this prayer for about six months. We got out of routine for several months! With my husband traveling 60% of the year, it was hard to keep any sort of routine. 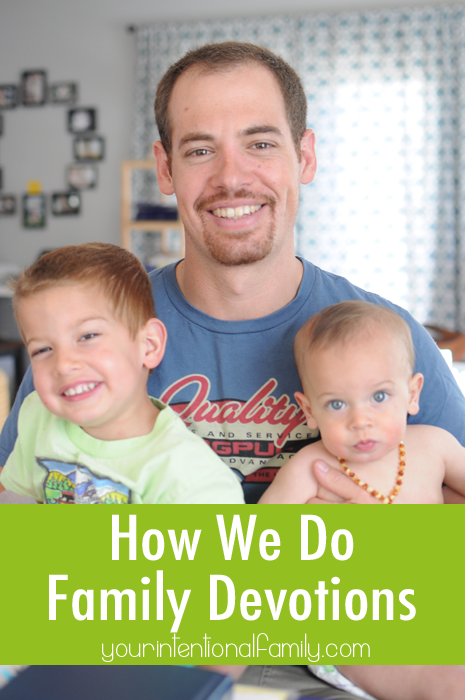 But now that my husband quit his job, we’re home together every day as a family. Therefore, we make family devotions a priority. I keep all of our daily materials in a Family Devotions Notebook. And that’s how we do family devotions now that our toddler is older! It’s not fancy, and quite frankly it’s often messy. We drop spoons, we spill milk, and sometimes our three year old refuses to cooperate altogether. But we persevere by grace knowing it’s not about how it looks, but about our hearts.